Since their rescue, and the rescue of the BRESMA orphans from earthquake-ravaged Haiti in January, I have kept in regular contact with Jamie and Ali McMutrie. Our meetings usually take place over dinner at Las Velas with Jonathan Wander and often involve a few margaritas, lots of laughs, and plenty of held-back tears. I always want to keep you all updated as to what’s going on with the girls, because your help was so instrumental in spreading the word that lit the fire that got them and the children rescued. 1. They are in the final stages of the land purchase — land that will one day house Jamie and Ali’s very own orphanage. This land purchase will be finalized when the girls return to Haiti early next month. 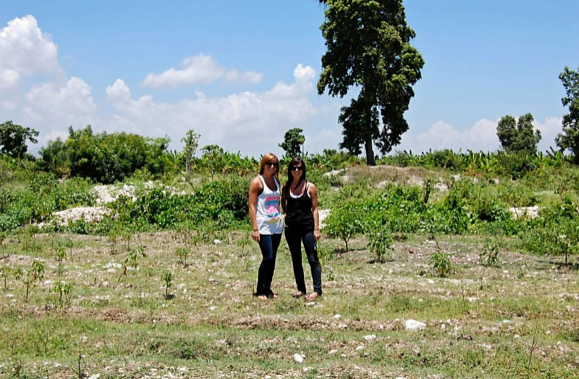 Here are Ali (left) and Jamie standing on what will be soon be their new Haitian home, resting on five acres of land approximately 19 miles north of the heart of Port au Prince, Haiti. 2. 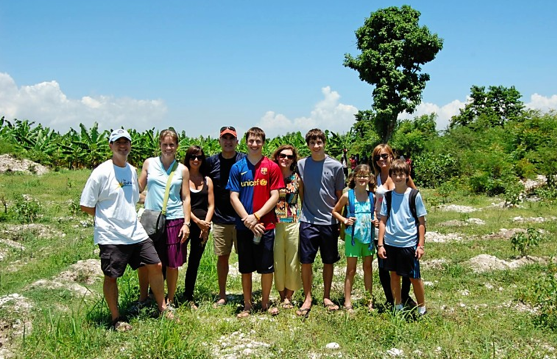 While in Haiti these past few weeks, Jamie and Ali spent some time with the Lansdown family who then made a donation that was double-matched by Newmont Mining Corporation, bringing the total donation to $250,000. 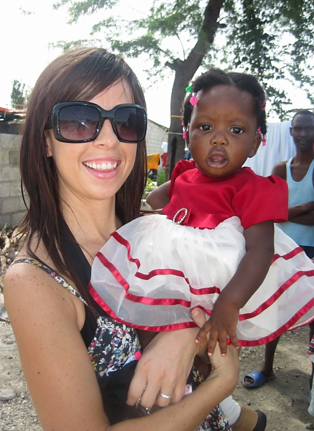 That will go a ways toward helping Jamie and Ali meet their fundraising goal to build their orphanage through their 501c3, Haitian Orphan Rescue. Here are Jamie and Ali standing with (from left) Rich Harris and Lisa Harris of The Road to Hope, which has raised over $70,000 for Haitian Orphan Rescue and will be facilitating the new $250,000 donation, Guy Lansdown, Jason Lansdown, Nicola Lansdown, Ryan Lansdown, Rachel Harris, and Zach Harris. 3. One thing Jamie and Ali are very excited about is that the land is very fertile. This fertility, in addition to the fact that the land is in a perfect spot for a well (a high water table and far enough away from the ocean), will allow their new orphanage to be self-sustaining. If you know or see or meet someone from one of these companies, do me a favor and give them a giant pat on the back for what they’re doing. Hell, hug ’em. Those companies will be working with Tecina SA, a construction company in Haiti. Just so many exciting things happening for them and I’m so happy to be able to share them with you. I’ll keep you updated as I can. i just hope Mr. Katselas will do better than the abominable high rise apartment towers that blighted East Liberty (and elsewhere) for so many years. Congrats to these women and kudos, too. I know I would not have had the courage or fortitude to match their accomplishments. Lucky, lucky children to have the McMurtrie’s to love them! the massaro folks do really exciting work. have they said whether they’ll use any bamboo technology for the new building? Please continue to keep us updated and let us non-architect/builder/engineer types know how we can pitch in. I never even thought about that. You just gave me the chills. I’ll have to start reading “The Radical Middle” again to see how long it takes Chad “Munster” Hermann to start bitching about the futility of helping out with this effort. Like many baby boomers, I shake my head over today’s 20-something generation guys and gals. Feel like many important values have been lost. Then, thanks to Ginny’s blog, I read about Jamie and Ali and I snap back to knowing there are some very good, very selfless people among that generation. God bless them. Glad to see item #3, that the land is fertile with a good water well. Hopefully this will help them develop self-reliance and break the cycle of poverty. Great news! Thanks so much for sharing! I saw Jamie and Ali for the first time at the Girl Scouts Western PA awards of distinction dinner, where they received the Humanitarian award. It was great to see them honored. I hope some of the deep pockets in the room are stepping up. Thanks for the update. And thanks to Scarehouse Scott for the perspective! Wow! Those girls are amazing! Thanks for sharing! That is wonderful and I am happy to see that out of this travesty something new and wonderful is born. Those women are just phenomenal. They are an inspiration. Thanks so much for the update! So great to hear an update! Its a shame how quickly people forget. I’m so excited to hear their dreams are coming true! Congratulations Ali and Jaime, your hard work is paying off. I wish you the best of luck and will keep you in my thoughts.